This will not be shocking news to anyone who is a longtime reader, but I am pretty hopeless when it comes to baking. I mean, I get anxious just thinking about cupcakes. The words “baking powder” and “baking soda” make me dizzy. And my hands sweat at the notion of making something sweet for a loved one. Unless that something is a meatloaf muffin — yeah, that happened. But a three layered cake? You’ve got to be kidding me. The way I see it (slash, explain my lack of skills in this area) is that I am plain awful at baking because I am so damn awesome at experimenting. I love breaking with tradition and getting all James Dean on a recipe, replacing sodium and salt by throwing odd stuff in to shock and surprise the palate. Which not only makes dishes my own, but also makes my guests swoon. Being a bad rule follower makes me a great low-sodium cook (horn, tooted). But it also makes me a lot of goopy cookies. And I’d be okay with that reality if it wasn’t for the fact that, despite my baking handicap, I really do like to make special treats for special people on special occasions. Of the non-meat-muffin persuasion. So a solution was needed. One that let me have my creative wiggle room and my cake too, literally. 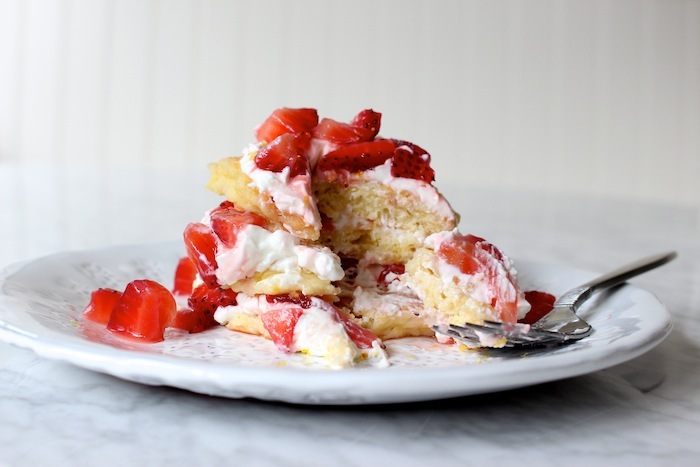 And the result was this Strawberry Short Stack Cake. It’s basically just pancakes (easy) layered with Greek yogurt frosting (what?) and honey-macerated strawberries (yes!). There’s zip from a little lemon zest, zing from Greek yogurt, and yum from the sweet strawberries. And in the end, there’s a three-layered pancake cake that looks impressive and tastes heavenly. It’s low in sodium. Low in time. Low in chances for baking failure. And as an added bonus, loaded with strawberries, which are not only nature’s sugar snack, but also nutritional powerhouses. Just one cup can help boost heart health and lower blood pressure (I’ll eat to that). Meaning you can have this for dessert or breakfast. For TGIF or Sunday mornings. And pretty much any time of year for any reason, because it’s strawberry season 24-7, 365 days a year, people. 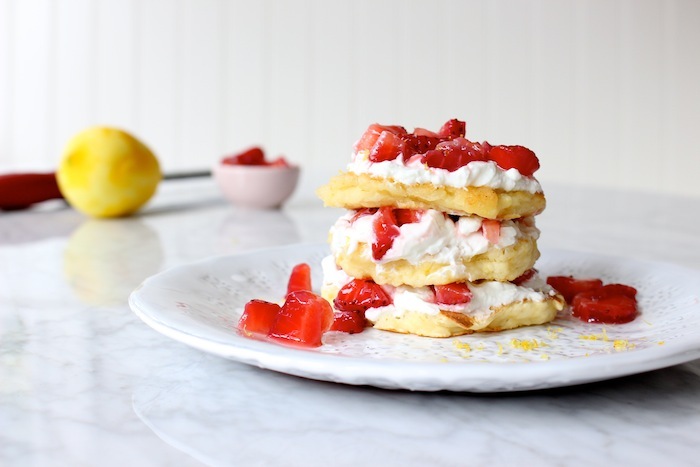 So the next time you want to bring a smile to someone’s face without breaking out the mixer or the oven, try these Strawberry Short Stack Cakes. And remember to use the leftover batter for mini pancake dots, which are pretty much best thing ever since Short Stack Cakes. 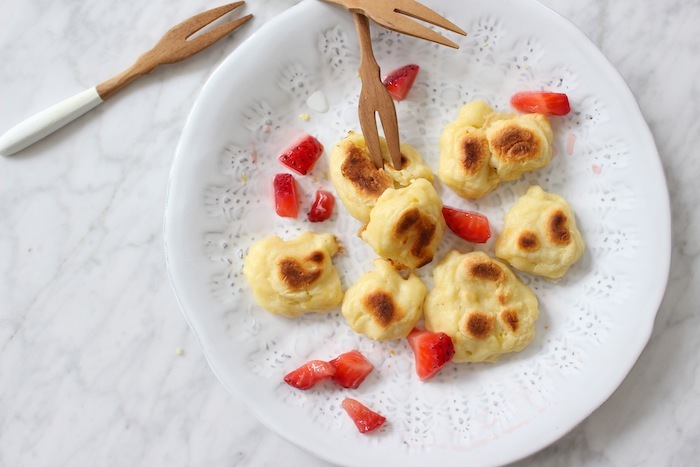 And check out these links for other strawberry inspiration, pancake recipes, that Greek yogurt frosting, and a chance to win a Le Creuset Skinny Grill. Happy Friday. STRAWBUFFALO WINGS: You read that right. Ditch the bottle BBQ sauce for this spicy, fruity marinade. LEFTOVER LEMONS: Here’s a sunny citrus pudding that would make even Bill Cosby blush. MEDITERRANEAN DIET: Greek yogurt + powdered sugar = awesome frosting town. BRUSCHETTA ‘BOUT IT: Amuse your bouche (and the bouches of your guests) with these balsamic marinated berries. YOU GO, GRILL: Celebrate National Strawberry Month by entering this Rafflecopter Contest for the chance to win a red hot Le Creuset Skinny Grill. See the California Strawberry Commission website for details. Prepare your macerated strawberry filling by mixing the diced strawberries with the honey and lemon juice in a bowl. Then cover and refrigerate for an hour to a day ahead of time. When it’s time to make the cakes, use a medium bowl to mix the banana, egg, flour, and vanilla together until well combined. Add the lemon zest and give the batter another few swirls. Then melt a 1/2 teaspoon of coconut oil in a large skillet over medium heat. When hot, add the banana pancake batter to the pan, making three mini pancakes at a time – about 3 inches in diameter. Cook until the pancakes turn golden in color, about 3 to 5 minutes. Flip and cook again on the other side, another 3 to 5 minutes. Remove the cooked pancakes to a plate and continue until all the batter is used, adding more coconut oil as needed. To build your cakes, take one pancake and spread a tablespoon of yogurt on top. Spoon some macerated strawberries over the yogurt and cover with another pancake, another layer of yogurt, and some more of the macerated strawberry. Note: If making two cakes, use three layers of pancakes. If making four cakes, use only two layers. To finish, drizzle the delicious juice (found at the bottom of your macerated strawberry bowl!) over the top of the Strawberry Shortstack Cakes. Sprinkle with leftover lemon zest and enjoy. Disclaimer: This post is sponsored by the wonderful California Strawberry Commission. 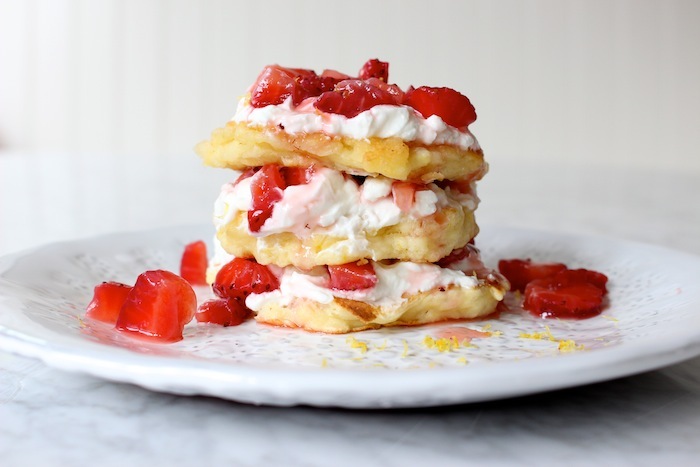 However, the opinions, recipes, and genuine love of these Strawberry Short Stack Cakes are my own. And besides promotional links, SodiumGirl.com is not associated with or responsible for the Le Creuset Skinny Grill giveaway. I might just be under-caffeinated, but is there an accompanying recipe anywhere? Or is it just the general idea being presented? I, too, am baking-challenged, so I appreciate you posting a recipe that even I can manage! Looks delicious! I couldn’t find a link to the recipe. What pancake recipe did you use? HELP! I can’t find the link to click to the recipe. What low-sodium pancake recipe did you use. This looks delish and I want to make these. Yes the recipe I used is the banana blueberry recipe (without the blueberries) that can be found here! This looks awesome….I am SO making this for the kids!